The newly developed Satake Destoner separates stones and heavy impurities from rice utilising bulk density difference. Conventional sifting methods cannot perform this separation efficiently when compared to the new Satake Destoner. Rigid heavy duty construction with thicker steel plates and sturdy frames ensures long life. 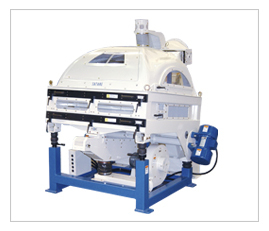 This is the ideal machine for separating stones and sand from rice in an efficient, trouble free manner.